First week of school activities – when a certain point in the summer hits I know it is time for me to start planning for the new school year. Ah, Back to School! That wonderful time of year when teachers starting gearing up to meet their new students, start decorating their classroom and bulletin boards, and do their best Professional Development on Pinterest. For many teachers, this is a wonderful time of year, as you are rested and recharged after a summer off, and are ready to get back into the classroom. For some, it may be a nervous excitement as you switch grades, schools, or maybe this is your first year of having a contract teaching job. With so much to think about, I want to help you out by sharing the details of my Back to School Activity Bundle. 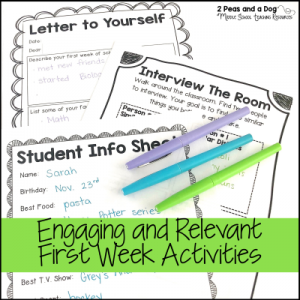 These 9 activities for your first weeks with your students, will begin to forge those lasting bonds for a successful year! My biggest tip for back to school is get to know your students as soon as possible and acquire the information directly from the source – your students! Middle school students are fairly accurate in their understanding of their skills, strengths, and areas for development. Don’t rely on last year’s report card as your only method of getting to know the learners in your classroom. Activity #1 in my bundle is sure to help you get to know your students fast. Use the Student Information Sheet to have students explain all about themselves in a highlight reel. 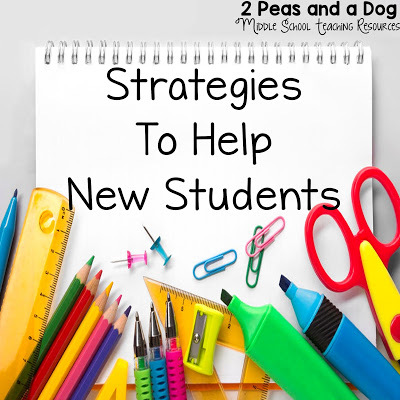 The information in here will give you some ideas for conversations with students in the first few weeks and maybe some areas of interest to capitalize on making the subject matter exciting, fresh, and relevant to their lives. After you know your students, it’s important for them to get to know each other. In some cases, your students might have graduated with their peers through each grade, and already have best friends established. Sometimes students have best friends, but they are in a different class, and are struggling with whom to connect to in your class. Or perhaps, everyone is new and knows very few people. 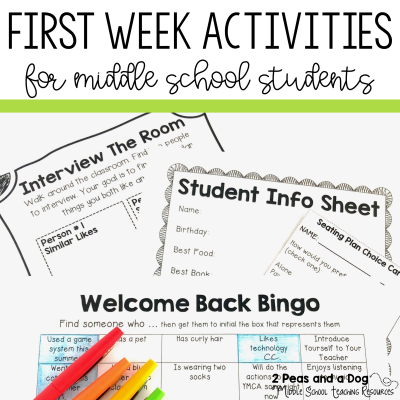 Get the students in your classes up and talking using my Back to School Bingo and Interview the Room Activity. In Back to School Bingo, students potentially get to meet and talk with everyone in the classroom as they find opportunities for connections. It gets everyone up and moving in an energetic way as they hurry to be the first person to fill their card. After breaking the ice with this activity, I have the students work on the Interview the Room Activity by conversing with two peers to know a bit more about each other. I find students are much more open to discussing themselves if they already have a bit of a connection from mingling during Bingo. To break up the time spent mingling and meeting new people, I give students activities they can complete independently to share a bit more about themselves as a person and learner. One of my favourite ways to do this is in my Dear New To Me Teacher Letter Writing Activity. I provide students with sentence starters, included in the activity, and have students write me a properly formatted letter all about themselves. Ideas they might describe are their interests, about what languages they speak at home, and what their goals are for the year, among others. This is invaluable to me as I get to know what they most appreciate about themselves and what they are worried about this year, and I also get a sneak peek at their writing ability. Another great activity for the first week is my Journal Writing Summer Vacation Prompts. I like to have the students justify their choices of comparing their vacation to 5 different media choices. These can be added to students’ interactive journals as you set them up, and provide another discussion point to further get to know your students. To continue the writing groove, I love to hand out the Interactive Story Writing Activity, it gives students the opportunity to work with their peers as they complete a story starter on the new school year and get their writing skills back in practice. Reading the stories that result is such a fun class bonding experience as well! I find that the first week or two of school can be overwhelming for everyone, but especially the students. Likely they are meeting several new teachers and classmates, sharing about themselves and learning about their peers, and relaying this information back to their parents and guardians at home who are anxiously awaiting the news that their children are happy and enjoying class. In the midst of all this busy activity, the student can sometimes forget to reflect on how they feel. In the Letter to Yourself Time Capsule Activity, I give the students a graphic organizer to help them record their first week and their feelings about school. You can give the students the opportunity to look back and reflect on it throughout the school year as they grow and work on their goals. One of the first assessment pieces I give is the Student Identity Art Assignment. It’s a fun and quick assignment that showcases the cultural background of the students in the classroom. Students can show off both their creativity and share more about their heritage. I like to put the completed pieces on a bulletin board in our classroom for our Back to School event! The last activity I have in this bundle is an important one as it gives the opportunity for student voice in the classroom. Towards the end of the first week, I hand out the Student Seating Plan Choice Cards. These cards ask students to really reflect on themselves as a learner and take the autonomy to select their best learning environment. I like to hand these out on the Friday of the first week of school, and collect them back at the end of the day. In this way, students have had 4 days (we start school on a Tuesday in my school district) to meet the people in the class and get a feel for the environment and where they would like to be in it. By collecting them on the Friday, I have the weekend to plan out a seating plan based on their suggestions. 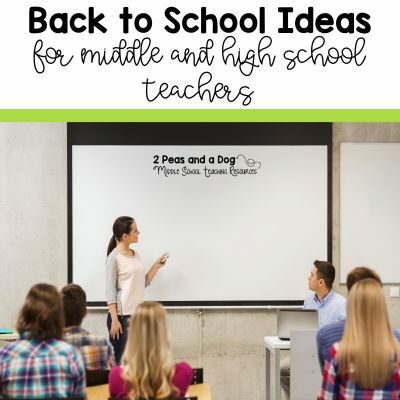 Back to school time has tons of things to think about and coordinate. 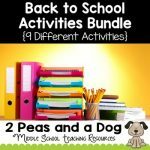 Be sure to grab my Back to School Activity Bundle to take some of the pressure of planning away. 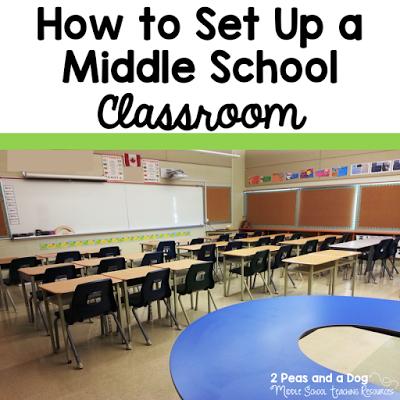 With these fun and interesting activities, you and your new class are sure to learn a lot about each other as you set up and build the classroom community together. Have a wonderful school year. Don’t forget to connect with me on Instagram to see how my year unfolds.